Over the last few months, everybody was so occupied by estimate/guess how much users Google+ has, that it seemed we might have forgot a little about the current estimations and analysis of its biggest competitor (which is also the biggest social network in the world), Facebook. But couple of days ago new estimated Facebook user’s stats have been published and they are very interesting. Gregory Lyons, the insight analyst of the digital marketing agency iCrossing, is predicting that Facebook will reach for 1 billion users until August 2012. The analyst is beginning his estimation from September, the last time when Facebook has disclosed its statistics– More than 800 million active users. According to the analysis, today (mid-January 2012) Facebook has about 870-880 million active users, in early March it will hit 900 million and by August the social network would have 1 billion active users. Gregory is indicating that most of the growth won’t come from countries like the U.S. or the U.K. (early adopting countries), but from developing countries like India or Brazil- While in the U.S. and the U.K. nearly half of the population are active on Facebook, in India it is only 3% and in Brazil it is only 16% and therefore they holds a much bigger valuable growing potential. 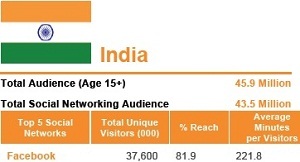 Facebook has about 82% reach to all India’s internet audience (43.5 million Facebook users out of 45.9 million internet users). 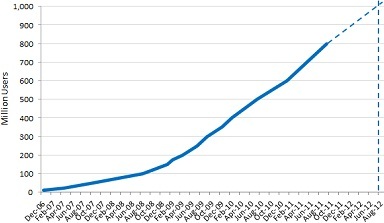 India general internet users population is predicted to increase in 2012 tremendously (India’s population is more than 1.2 billion) and consequently, the number of Facebook users will most probably also gain a strong increase. In Brazil, things a little more complicated. While Brazil’s internet users population also predicted to increase pretty fast in 2012, Facebook reach is lower relatively to other countries (70.9%). 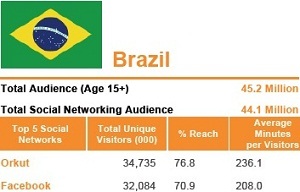 Believe it or not, Orkut (Google’s old social network) is the most popular social network in Brazil, however, Facebook is closing the gap and most likely it will surpass Orkut in 2012.